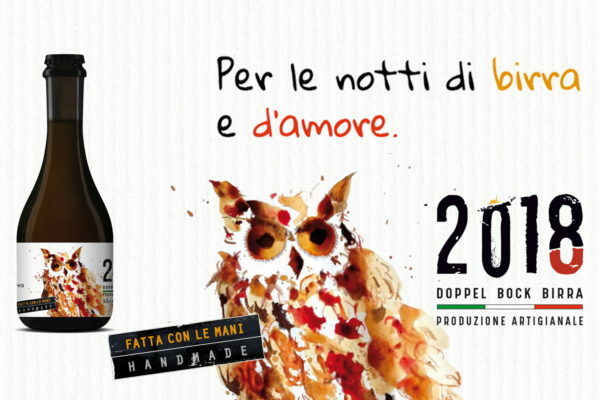 After the success of Imperial Coffee Stout 2017, OTUS Brewery created a new limited edition: Doppelbock 2018, a dark, strong and charming beer. Otus Brewery continues its production of end-of-the-year celebratory beers: if Otus has worked on a sumptuous Imperial Coffee Stout in 2017 (only 2000 bottles, all sold in few days), this year Otus chose an important Doppelbock, intended to leave its mark. Doppelbock 2018 is ideal for realxing moments; to sip slowly during those "nights of beer and love". Aroma: honey, dried fruit, soft fruit like cherry and plum, chocolate. Taste: the soft flavours of dried fruit and soft fruit are sweetly released in the mouth and then they leave space to sharp roasting and coffee hints. Flavour: interaction between aroma and taste. QB18: when good beer meets good cheese. To complete and give importance to the tasting experience, Enrico Rota, chairman of Otus craft brewery , looked for a type of food that could enhance Otus 2018 characteristics. Quartino was the choice, a raw paste soft cheese from Bergamo. Quartino is produced with cow's milk and it is melt-in-the-mouth, it reminds of underwood. It can enhance hints of the liquids with which it is sponged during the maturing, in this case the hints of Otus 2018 limited edition. Taddei dairy from Fornovo is managed by Massimo Taddei and his wife Camilla. It is a craft dairy from Bergamo that is focused on tradition but, at the same time, opened to innovation, only when it guarantees a further step to a better quality. Massimo Taddei has immediately accepted the idea of producing QB18 (acronym for Quartino del Birraio 2018): " The syntony with Enrico Rota is great" affrims Massimo, enthusiastic of refining his specialty with a quality craft beer for the first time. QB18 will be on sale from 22nd October in shops, pubs and specialised restaurants. Otus 2018 (in bottles) will be on sale from 22nd October in shops, pubs and specialised restaurants, where it can be paired with Quartino del Birraio.